Damage to the frontal lobe of the brain causes a range of symptoms, including motor weakness and behavioral problems. The frontal lobe is a relatively large lobe of the brain, extending from the front of the brain almost half way towards the back of the brain. A variety of conditions can damage the frontal lobe, including stroke, head trauma, and dementia. The cerebral cortex of the brain has 4 lobes on each side: the frontal lobe, the temporal lobe, the parietal lobe and the occipital lobe. Each of these regions carries out specific functions, and damage to any of these areas results in corresponding impairment. The frontal lobes are relatively large compared to other regions of the brain, and the extensive functions controlled by the frontal lobe reflects that large size. The frontal lobe plays a substantial role in decision making, self-control, and emotional regulation, providing the ability to behave appropriately in interpersonal situations and to regulate behavior in a socially acceptable manner. The frontal lobe also integrates thinking skills by maintaining attention, high-level thinking and problem-solving. It is believed that humans' large frontal lobes are responsible for advanced thinking and innovation, as well as the ability to imagine situations. There are some differences between the right and left frontal lobes. The back of the frontal lobe is a region called the motor strip, which controls and directs the body's voluntary (purposeful) physical movements. The left motor strip controls movement of the right side of the body, while the right motor strip controls movements of the left side of the body. There are also functions that are predominantly controlled by the left frontal lobe or the right frontal lobe. 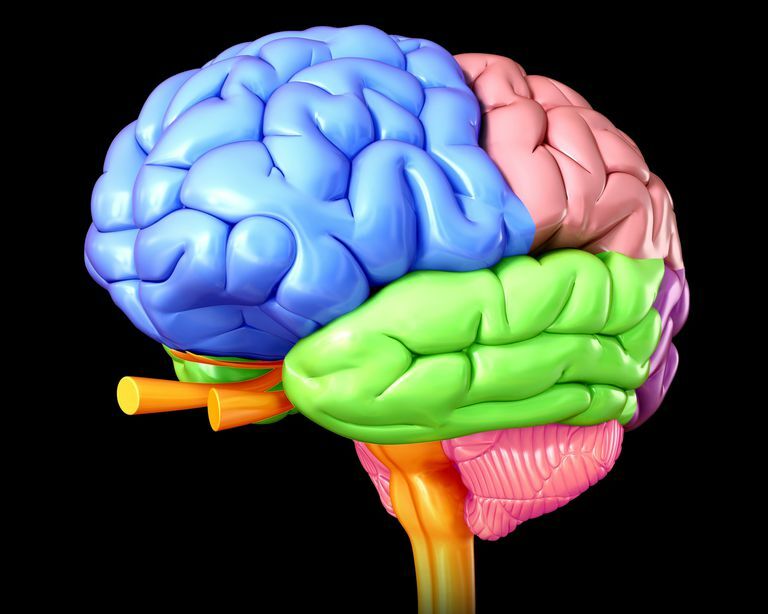 Along with the neighboring parietal and temporal lobes, the dominant (usually the left side) frontal lobe is involved in language, rational, quantitative, and logical thinking, and analytical reasoning, while the right frontal lobe is involved with creativity, imagination, intuition, curiosity, musical and artistic ability. Damage to the frontal lobe is most commonly caused by degenerative (worsening) disease or a stroke, and there are other, less common conditions that affect the frontal lobes as well. Most types of dementia, including Alzheimer's Disease and Lewy Body dementia, are caused by degeneration of the frontal lobes. It is not clear why these conditions occur. As neurons in the frontal and temporal lobes become atrophied (shrink) over time, difficulty in thinking, controlling emotions, inability to organize, trouble communicating, and unusual behavior develop. Strokes and transient ischemic attacks (TIAs), can also impair function of the frontal lobe. When blood flow through one or more of the blood vessels that provides blood to an area of the frontal lobe becomes interrupted or bleeds, the correspond region of the brain suffers, and cannot function as it should. Vascular dementia, a type of dementia caused by the cumulative effect of several small strokes, is a common cause of symptoms of frontal lobe impairment. A Brain CT or a Brain MRI can detect a frontal lobe stroke, and possibly an infection. However, when there is another cause, such as dementia or a concussion, then a brain imaging test often shows either atrophy, or may not detect the frontal lobe damage at all. To assess your damage to the frontal lobe, your doctor might send you for concussion testing or a complete neuropsychological evaluation. Testing involves skills of speech, motor skills, social behavior, spontaneity, impulse control, memory, problem-solving, and language. Treatment of frontal lobe damage can include a number of strategies, depending on the cause. For example, an infection can be treated with antibiotics, and brain tumor can be surgically removed or treated with chemotherapy or radiation. Degenerative disease, such as Parkinson's disease, Huntington's disease, and dementia are usually treated symptomatically, but, at this time, there is little that can be done to prevent conditions from worsening. When frontal lobe damage manifests as motor weakness, rehabilitation can help you optimize your existing motor function. Rehabilitation involves strengthening and optimizing your existing motor skills. Rehabilitation is more challenging for cognitive and social deficits, and the focus of cognitive and behavioral therapy emphasizes regulating emotions and curbing impulsive behavior. The brain has two hemispheres, the left and the right. Yet, the frontal lobe is sometimes referred to as a hemisphere, which can be confusing. This confusing terminology stems from the fact that the early brain developes as three cerebral hemispheres, or sections, prior to birth: the forebrain, the midbrain, and the hindbrain. Each of these developing sections has specific functions. The function of the hindbrain is to control respiration and heart rate. The midbrain, located in the uppermost part of the brain stem, controls reflex actions such as eye movement and other voluntary movements. The forebrain, the largest and most highly developed part of the brain, controls emotional perceptions and responses, involuntary movements, sleep patterns, memory and organizational ability. The forebrain is further divided into two halves, or hemispheres, which are located directly behind the forehead. Any type of brain damage can certainly cause a great deal of stress. Whether you or a loved one has experienced damage to the frontal lobe, you should be aware that people can experience some degree of recovery, depending on the cause of damage. Behavioral and cognitive deficits can cause a great deal of angst and often interfere with healthy relationships. If you or a loved one is living with frontal lobe impairment, it can help to understand the symptoms and to tailor your expectations. Sometimes, taking the time to patiently explain why certain behaviors are not appropriate can help, and sometimes patience does not help, and acceptance may be the only option. Barrash J, Stuss DT, Aksan N et al. "Frontal lobe syndrome"? Subtypes of acquired personality disturbances in patients with focal brain damage. Cortex. 2018 Sep;106:65-80. doi: 10.1016/j.cortex.2018.05.007. Epub 2018 May 16.